“I am thrilled to see that California, is once again, at the forefront of common-sense road safety legislation. Signing of this bill will bring legitimacy to this practice and help to keep our roads safer and our drivers – both motorcyclists and motorists – better educated.” Assemblymember Quirk commented upon learning his bill was signed. The ability of the CHP et al to educate riders and drivers in California is the primary reason I’ve worked put so much work into backing this bill—the previous CHP guidelines were starting to have positive effects on both riders and drivers. 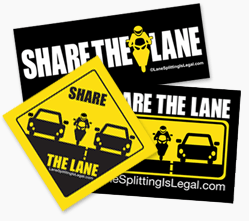 You can read more about the OTS lane share surveys and Dr. Rice’s lane splitting research here. While I’m a little bummed that Quirk’s office didn’t include a shout-out to the moto-community for all the work we put into this bill with him in the press release, I’m stoked that we’ve finally crossed the finish line. Stay tuned here or to the LaneSplittingIsLegal Facebook page for news as the work on the new guidelines progresses. ‹ AB 51 Has Achieved Concurrence In The Assembly—On To The Governor For Signature! Looks like the motorcyclist “lobby” spoke up and helped legalize a practice that I have rarely seen committed with safety. I have yet to hear a rational for allowing motorcyclists to drive outside the law. Bullies are clearly still winning. Ruth, for starters, we weren’t driving—actually riding—outside the law. If you want to understand why splitting is good, please check out the numerous studies on our resources page. I have no idea who the bullies you’re referring to are—perhaps the overwhelming majority of drivers trying to force policy on motorcyclists because they’re jealous and refuse to listen to reason? What bullies? To whom are you referring to? Riders weren’t operating outside the law. We have been operating within the law the whole time. This just codifies that. If you’ve rarely seen riders do this safely, then you must’ve witnessed a lot of accidents because of it. Can you cite any references? Any facts to back up your claim? Ruth, you really have no clue on what you are saying here, Listen, lane splitting was “NEVER” legal, but, by the same token it was “NEVER” illegal as long as you did it in a safe manor, I been riding from the age of 16, I am 60 now, never once have I ever had a problem with lane splitting, however, I did see several over the years get pulled over for intentionally blocking my passing which is a danger not only to me, on my bike but the others deriving should I have gone down, I am sure no one wants run over a fallen rider on the freeways here in California, my luck was, I had a CHP following me when these things happened to me and trust me, CHP bike officers hate it when things like this happen. Ruth, you really need to do your research, when traffic stops, and you are on a motorcycle stopped behind a car, the on coming car at night or day for that matter cannot see you as well and to many bikes get hit from the rear, this is one of the major reasons lane splitting is allowed in California, sure there are some who fly by stopped cars and yes, they are stupid, but open your door and you cause him to go down, guess what ??????? E dizem que os EUA são liberais, aqui no Brasil andamos livremente por todos os espaços que a rodovia permite. “Educational guidelines” is simply crap – just legitimizing what is fundamentally an unsafe practice and encouragement for the aggressive motorcyclists that routinely weave through traffic much faster the traffic is going. The ones “most in need” of educational guidelines will ignore them – only a moving violation has any chance of changing their reckless, menacing, selfish behaviors. There should be explicit sections of the motor vehicle code defining under what conditions lane splitting is illegal, and penalties equivalent to DUIs for violating them. im always worried about getting rear ended and crushed between 2 cars. I agree. I was hit by a motorcycle splitting lanes while I was legally exiting the HOV lane. That should be illegal. And the last couple weekends I saw packs (30) of riders showing off & impeding traffic. I used to move over to make room. I no longer do so unless there is enough room in my immediate lane. Since there’s so much crap near the divider, I got a nail in my tire. And why the hell do riders have to split, speed, ride so close & cut me off when there is room in the regular lanes! A great decision that helps those of us who commute in one of the most efficient means possible and help conserve the precious energy resources we have at our disposal. Finally, government gets SOMETHING RIGHT! Great victory for riders in the State. Hopefully this will set a precedent that will result in other states legalizing the practice. Idiotic and dangerous. I’ve seen this practice result in death while in europe. Just one car door opens while stopped in traffic and a rider dies. Morons. I’ve seen riders killed when struck between the front and rear bumpers of vehicles in stop & go traffic. If they were permitted to split lanes and avoid this dangerous spot, they’d still be alive. The person who opened a car door in traffic causing the accident and death is the moron. How many times have people been stuck in stopped traffic and gotten out to stretch, try to get updates on the situation, etc.? I’ve been in many traffic jams and seen lots of people exit their vehicles. Who would think to look for a motorcyclist driving between parked cars before opening a door? Not me. My husband is a rider and I would be upset if I saw him do this in traffic. Do you actually condone people getting out of their car on a highway? How stupid can you be? Why will you open your door while sitting in traffic?? ?duhhh..unless you don’t have an AC in ur car. Thank you for showing me the light. I now understand the need to thin the herd. See you at the Darwin Awards. I was lane splitting a few years ago on the I15 between Temecula and San Diego during a brush fire. It was a long wait and people got out of their cars. So many people between the lanes I couldn’t ride anymore. I stopped and got off the bike and met new friends. No danger there, just good times with complete strangers. This was far from overdue legislation. The bottom line is now there is “law” which has created public awareness of what the motorcyclists legal right has been, and that is lane splitting is NOT ILLEGAL, so when I ride my bike it is now YOUR RESPONSIBILITY to watch out for me while you drive. The SAFETY concern associated with lane splitting is rarely on the motorcyclist, as we are overtly aware of the dangerous conditions as we travel, rarely are we at fault for not looking out for other vehicles on the roadway, the concern lies with the motorist who doesn’t bother to look, signal and make safe driving choices, which is why there are laws in the CVC that state it is illegal to impede traffic, open doors, etc… I’ve ridden enough years that I wont justify my experience and capabilities, I commute in the bay area and quite honestly I’m tired of feeling like a pinball….not only have I had doors open on my (which is illegal) and cars change lanes directly in front of me (also illegal as you are not to change lanes without signaling and ensuring it is safe to do so, if I’m there on my bike, it aint safe!) But I’m currently attempting to put my body and bike back together since I was plowed into February 23, 2016 while I was commuting home, in my own lane,(not splitting lanes) by some inconsiderate PRI@#*!&CK Porsche driver who was just in too much of a hurry to sit at a stand still in traffic that he didn’t bother to look to his right before changing into my lane. THIS LAW, if nothing else will make more people aware! sorry to hear about the douche porsche driver. unless you drive a OLD porsche youre probably too busy drinking coffee on your cell phone. i hope you get back on two soon! lane splitting is not your lane. if a car wants to change lane he can legally and it is not his responsibility to see you coming up behind him. you need to always take care for your own life and choices you make. you take the chance like this idiot at 68 MPH you will loose at some point. is it worth it to you? Obviously, some of the non-riders haven’t got a clue what lane-splitting means to motorcyclists. And, perhaps, neither do they care to know. It’s sort of like trying to explain to a fish what a breath of fresh air on a clear, Spring day is! What’s the point? They’re rather content swimming in circles in their fishbowl. But I do wish there’d be a little more attempt to reach out between both commuter groups in this (and other) road issues. I’ve seen enough stupidity on the roads by both drivers and riders, and that while either commuting on my motorcycle AND on my bicycle. I love riding my motorcycle and ride daily, but I’ve become a firm believer that riding my bicycle is a far more dangerous of an activity given the absent-mindedness, selfish, and sometimes mean-spirited habits of many drivers. To be fair, though, that is a minority of drivers, but it really only takes one senseless mistake to kill a rider or pedestrian. It happens all the time, unfortunately. But to my friends riding, I want to remind everyone that we really need to “self-police” our own riding community, reminding and exhorting our brothers and sisters to curb our own enthusiasm and demonstrate responsible ridership. I think of myself as a fairly sensible rider. I have too many loved one’s to take care of and awesome friends to enjoy riding with to risk an unnecessary disaster on the road. I’ll only lane split with stopped traffic because that makes sense FOR ME and my personal risk assessment. But what really troubles me are my fellow riders who apparently abandon all common sense and civil responsibility, charging through traffic “demanding their rights” as a rider, and producing in their wake the resentment and bitterness expressed by some drivers represented in this blog. We all pay the price for that recklessness, even the guy who lane-splits in stopped traffic or the bicyclist on the right of the road. So someone will get pissed off by something I said, but that’s OK if causes us to pause and think and demonstrate more consideration towards each other. So if you’re a reader, then read this: Mark 12:31. Certainly wouldn’t hurt to do it, either. I ride a motorcycle and I am in favor of legalized lane splitting. But I agree with some that many motorcyclists lane split recklessly. Often when I am splitting lanes between rows of cars that are either stopped or moving very slowly, I need to duck back into one of the lanes to let another cyclist pass me. Some of these guys are going 20 or even 30 mph faster than the cars they are passing. But having said all that, the one who gets seriously injured or killed is the motorcyclist. If they want to go too fast, I say let them. For my part, I will continue to split lanes prudently. I have my M1 here in CA. My first bike was an old GS550, second bike a slight less old Yamaha Seca II. As a car driver in CA for over a decade, I’ve seen so much stupidity and recklessness on the part of motorcyclists (a few times have been reckless myself) that I DO NOT believe lane splitting should be legal on CA highways. Nearly every CAR/Motorcycle accident I’ve seen on highways was the net result of lane splitting, regardless of who was at fault. Car drivers literally looking over their left shoulders as they turn can still miss a motorcycle lane splitting on their rear driver side wheel. The problem with let the stupid bikers get into accidents is that it still costs the car driver money, time, aggravation. If also costs society money and resources. Unfortunately CA is an at-fault state, so someone always has to be held fully accountable. As a rider, I’ve had the experience of changing lanes in rush hour traffic, only to have a biker riding much faster than traffic hit my left rear side as I began a lane change. He of course claimed I hit him. Even before this event, I have had to hit the brakes or swerve away from a lane change where my signal was on because of a rider going much to fast flying up on me when I starting to change lanes. Cars have some much to look out for on freeways that, as a rider, I don’t think its reasonable to allow bikers a special right that doesn’t add any real value other than letting bikers have shorter commute times at the expense of car drivers. Sorry to be the skeptic, but I think your statement about: “Nearly EVERY CAR/Motorcycle accident I’ve see on highways was the net result of lane splitting” is either hyperbole or pure BS. I’ve been riding in California since 1971, for over 45 years and have been splitting lanes safely that long. I’ve witnessed and seen plenty of motorcycle accidents, including fatalities and none were caused by lane splitting. According to the Nolo legal site, 56% of motorcycle accidents were head-on collisions. 42% of car/motorcycle accidents were a car making a left turn in front of a motorcycle at an intersection. The rest were solo accidents where a bike hits a fixed object, the rider is going too fast or intoxicated. Lane splitting is mentioned but it’s statistically an insignificant number. Glad to see this finally get into law with some guidelines around it. The CHP guidelines were pretty realistic, but were sadly removed after a complaint about it being “underground guidelines” I have been riding in CA since 82′ and splitting most of that time. Had many close calls and almost misses (and a couple accidents) but not while splitting; rather while driving on city streets! Most folks in CA, like it or not , just accept the situation and many make room. Adding things like light modulators and riding with high beams (which is in the pre-lim guidance) helps others see you. Going slowly and not over certain speeds helps as well. Can anyone site the law? What is it? I see motorcyclists going well over the flow of traffic lane-splitting. Last week I was on I5 South in San Diego. My passenger and I both commented on the number of motorcyclists going way too fast given the slower rush hour traffic. Then, a horrible thing happened. A car went to change lanes and I don’t know if the car hit the motorcyclist or if he reacted by cutting right. The next thing we saw was debris flying and the truck that hit ran over him slamming on his brakes. This happened three cars ahead of me. Seconds later I saw something I never want to see again. The 24 year old motorcyclist dead. DEAD. Lying on the ground with his motorcycle next to him. DEAD!!!!!!!!!!!!!!!!!!!!!!! Gone from his parents, siblings, friends. I think I’m safe in saying that 80% of those lane splitting are going beyond safe speeds cutting in and out of freeway traffic. They are either oblivious or stupid (maybe both). Because of curves and hills, and the fact that the motorcycle is cutting in and out of lanes it very hard to see them coming. After the accident there was of course little traffic. I saw a motorcyclist coming, about 150 yards behind me lane-splitting. I decided to try something. I put on my turn signal to let those behind me I would be changing lanes. The motorcyclist didn’t slow down one bit. Of course I had no plans to change lanes. Wouldn’t you rather arrive a few minutes late than ending up in the morgue? I also have to say I feel so sorry for the truck driver. He now has to deal with the death of the motorcyclist even though there was nothing he could have done. Lindsay. With all due respect, I’ve been listening to emotional hyperbole like this for decades and it’s almost universally based on assumptions and incorrect observations. No one is denying that motorcycling is a more dangerous means of transportation than riding in an automobile. The risks are greater, which includes the risk of death, whether a rider is riding between lanes or in the lane but between stop and go drivers. This bill isn’t meant to address the risk of riding vs. driving. The errant assumption by many drivers is that splitting lanes is somehow more dangerous than placing yourself between cars and trucks in stop and go traffic. The studies and statistics prove it isn’t. We all feel sadness and remorse when a young person dies in a motorcycling accident. I’ve witnessed plenty of them. The question of fault is up to investigators. However I doubt you’ll find any riders here who endorse splitting traffic with a large speed differential, as you describe. I’ve seen that too, and all I can do is shake my head and say a quick prayer for the careless rider. On the other hand, if the rider was splitting at a safe and legal speed, then the car which moved over would be at fault. Just as with all traffic, drivers must check their mirrors and signal before changing lanes. This law lists a 15 MPH maximum speed differential between slow traffic and the motorcycle. 15 MPH is about as fast as the average person can ride a bicycle, and it gives ample time to see a problem and slow down or stop. After doing some research into AB51 this is what I found. b) The motorcycle is not driven more than 15 mph faster than the speed of traffic going in the same direction. 2) Provided that motorcycles must continue to obey existing laws relating to the safe operation of a vehicle. Josh, the information you’ve posted above is incorrect. AB 51 does not specify speed or delta, but simply formalizes splitting in the vehicle code and allows the CHP to create guidelines. The text of the bill is on the page you’re commenting on—just scroll up. The new guidelines should be published soon. Until then, there are no numbers codified into CA vehicle code. Major bummer that the parameters (per Josh’s 7/5/17 post), of the law, is difficult to find. I asked a CHP officer to clarify lane splitting and he referred to me their website. Went to the CHP website and no parameters but it gave the vehicle code numbers. Went to the CA DMV website and they no longer post the vehicle code. At least they had a link to get the vehicle code. Unfortunately, the vehicle code does not cite the specifics per Josh’s 7/5/17 post. Bottom line, in order for riders to lane split in a consistent manner the parameters should be easy to find. In the vehicle code and the CHP’s website. Walt, there are no parameters or guidelines posted yet because they don’t exist. The changes to the vehicle code as passed into law last year are contained in the post you commented on. That’s all there is. The post by Josh that you referenced is incorrect information—until the new guidelines are completed per AB 51, there are no formal or official guidelines. Presumably, once those guidelines are completed, they’ll be quoted on the CHP website, by the DMV, and so on. Perhaps someone can help me. I just went through all the relevant sections I could find in the 2015 CVC on the CHP website and for the life of me I can find no prohibition on 2 vehicles sharing a lane. I’m sure it used to be prohibited, and I expected to find the general prohibition and a new exemption from that prohibition for “motor-driven cycles” as they say. But I can’t find it. Obviously, it can’t be legal for say 2 cars or several motorcycles or 17 trucks to share one lane. Why would we bother to paint lane lines on the ground if it was? And what would make motorcyclists think there won’t be Smart Car lane splitters coming down the road? Or pairs of cars sharing a lane to take up the space between lanes you use when lane splitting? Wow. “Put your stickers on every vehicle you own and maybe even some you don’t.” Wow. I’m sure it’s been said by some lowlife liberal activists before; it would certainly be their style to slap a liberal candidate’s sticker on a car with conservative stickers. But I’ve never seen it in print. You really didn’t have the wherewithall to self censor that? You believe it and you figured you were safe putting it on a website that only motorcyclists that think lanesplitting is just fine come to. Wow. Oh, that’s right. You put a smiley after it. I see. You were just kidding. Right. I’m sure no riders will take a few to slap on cars that offend them as they lane split. But you’re right. They certainly didn’t need you to suggest it. I’m quite sure they would’ve thought of it on their own. It’s a joke, Warren. Ease up, and go read the vehicle code, while you’re at it (referencing your other comment). And take your simpleton “lowlife liberal activists” nonsense elsewhere. My, what a substantive refutation. You obviously have a lot of evidence to back up your position that lane splitting has been “legalized.” Except that it was legal before. Right. Got it. I’ve just been going by the seat of my pants the last couple of days since my insurance company published a “quiz” that informed me that lane splitting had been “legalized” in California. I was basing my opinion that it was illegal but unenforced based on extremely limited research in the CVC 25 years ago. But I’ve been reading up on it more today and was astounded at how weak you people’s claims are! I’m always suspicious when people scream about something being a fact and they have studies to prove it and their story keeps changing. You guys have heard of Wikipedia right? I’m sure you must have read the lane splitting entry. No doubt you feel it was written by people out to get motorcyclists. It reviews your “studies” in several countries. Essentially there’s a “slight” reduction in rear end collisions to the biker when you lane split but a more substantial increase in collisions where the biker rear ends someone else. Read it everyone! Read what it says about whether it’s legal or not. It’s just what I’ve been saying from a common sense standpoint all along. You need to examine your own biases and motivations motorcyclists. You’re starting from your desired outcome and working backwards. You don’t like sitting in traffic and since you can fit between the lanes you’re going to do it no matter what the evidence says about whether it’s safe or legal. You’ve just been benefitting from law enforcement refusing to enforce the law for years. You know deep down it’s illegal so you convince someone to pass a law that says only what it is and allows the CHP to express their opinion of it’s advisability. That’s all. And you jump on it and claim the bill legalizes it when you know perfectly well it does no such thing. Warren, I’m going to reply to you one more time, in hopes that you’ll do some reading. We have most of the research on lane splitting linked on our resources page. Your claims of working backward to a desired outcome are simply wrong. In one of your comments, you say splitting was illegal, and in another you say it was legal all along. There’s a ton of information here and elsewhere refuting your rambling nonsense. The point of AB 51 was to formally recognize splitting so that the CHP and other orgs could educate drivers and riders again. Please, educate yourself, or shut up. The #1 reason that cagers hate motorcycles is because they are too Lowed, you can here some of them 2 miles away.